Have you ever bought a game without knowing what it’s about, read the manual at home, and then left the game on the shelf for a year because you were afraid to try it? No? Well, I’ll admit that I did. Last year, in Essen, I bought a copy of alea’s Palazzo, which I hadn’t heard about before, with no other reason than the 5 Euro price tag. When we got home and I was looking through our loot bag, what I saw was a confusing auctioning game that looked like rules and theme were invented by two completely different people, quite possibly without ever talking to each other. Now, not quite a year later, we finally decided to give it a go, and once again I had to learn that first impressions can be wrong. Once you get playing, the game is not confusing at all and turns out to be quite fun and quick to play. The theme, though, still turns out to make slightly less sense than Klingon tax law. 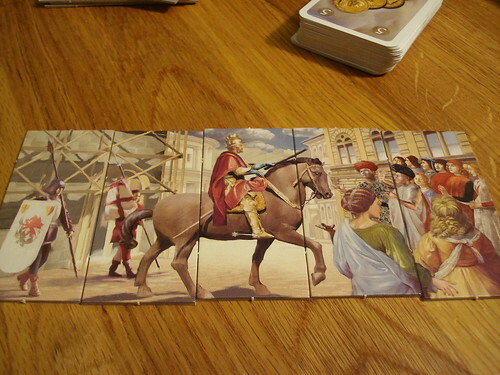 The game takes place in Florence, Italy, around the 15th century. You are a person of some wealth and influence, and as it befits one of your position, you compete with all the other rich folks about having the most beautiful, the heighest, the most windowed Palazzo! The most windowed Palazzo? Yes, I’m afraid you read that right. Victory is based, together with two other factors, on the number of windows in your palazzo. I appreciate that glass was expensive back then, but I didn’t think it would make this huge a difference if your 5 story marble palace has one window pane more or less. But lets not count our windows before the walls are built. You build your palazzo floor by floor, with floors you either purchase at an auction in one of the four quarries or buy from the floor store without any fear of competition, but at a usually higher price. Floors can be built of brick, sandstone or marble, have one to three windows and can be a first to fifth floor. So, the floors you are going to buy already know where in the building they belong. I can only imagine structural reasons for that. floors can either go on the ground (starting a new building) or on top of floors with a strictly lower number. So you can not place a second floor on top of a third, neither can you put another third floor on top of a third. having gaps in your floor numbering is okay, you can put a fifth floor right on top of a second. you can only place new floors on top of existing ones, not below. Just in case that wasn’t obvious. To get all these shiny, polished floors, you only miss one key ingredient now. Currency. Palazzo comes with more currency than you would expect: three of them. Money comes in three different currencies which you can’t mix when paying. Each currency comes as cards in values from three to seven. Then there is the certificati which are worth 2 points in any currency. And if you still lack some money, you can play three cards of the same value in all different currencies, which makes them worth 15 whooping abstract money units and can still be mixed with cards from one currency. You start the game with 4 money cards, and since that won’t last long, your first choice of action when it’s your turn is to get more money. You turn one more card from the stack than there is players. Then you get to take two of those cards – your choice, of course – afterwards all the other players get to pick one of the remaining cards. Bloody parasites. If you think you have money enough for now, you can go and buy or auction floors instead. With either of those two options, first you turn the next to floors from the current pile – floors are divided into three piles by the number on their backside – and put the first of them on the floor store and the second one on one of the quarries. Which one is based on the number of windows in the floor, but it might as well be random. Then you decide: buy from the store, or auction the floors in the next quarry. If you decide to buy from the store, that’s what you do. The other players can not interfere. 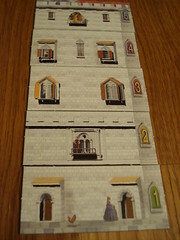 You can buy one or two floors, at a price of 10 – number of floors in the floor store at the beginning of the turn. Since you just put one floor there, this always works out to 10 – number of floors in the floor store + 1, so the more floors are there, the cheaper they are. Paying for two floors here is only one transaction, so all has to be paid in the same currency. If, on the other hand, you enjoy the excitement of a good auction, you can auction off all the floors in one quarry. Which quarry that is is decided by the master builder, whose only purpose is to move to the next quarry that is not empty and show what is about to be auctioned. Nevertheless, the master builder is incredibly important: he’s the only meeple in this game. To start the auction, you take the three-point certificato. This is your initial bid, placing you three abstract moneys ahead of the others. The next player may now play money cards to outbid you, then the next and so on, until all but one passed. Again, only one currency is allowed, plus certificati and triplets. Players that pass take all their cards back, the winner takes all the floors from the quarry and places them. If there is more than 4 floors in the quarry being auctioned, then no auction happens and every player takes one floor for free, the rest is then removed from the game. When buying at the floor store or the quarry, you always have the option to remove the tiles you bought from the game instead of building them. This is a useful strategy towards the end of the game, when you don’t want your opponent to get more valuable windows, but you really have no space to put that floor. When you have enough money and don’t see any goods that you like, your last option on your turn is to remodel one of your palazzos. This is where the magic of renaissance architecture really shines: to remodel, you can remove one floor from anywhere in a palazzo – not only from the top – and put it on the ground as a new single-floor palazzino, you can take a single floor and put it into it’s place in another palazzo, or you can take a single floor and remove it from the game. The game ends when all 5 tiles of the game-ends-picture have been uncovered from pile number three of floor tiles, where they were shuffled at the start. The picture shows the arrival of the imperial envoy in Florence, which marks the end of the building contest. That’s what the manual says. It’s yet another thing that doesn’t make a whole lot of sense, thematically speaking. But it’s the nicest looking end-of-game marker I remember seeing, so I’ll let it pass for now. Now the points are counted. Palazzi with only one floor score -5, palazzi with 2 floors zero. Everything above that scores points equal to number of windows, plus an additional three for four floors and an additional six for five floors. You can score additional points if your palazzo is built from one material only. It doesn’t matter which, three or 4 floors from the same material add three points to the score, five points add six. As you can see, the scoring procedure is a bit mathy. 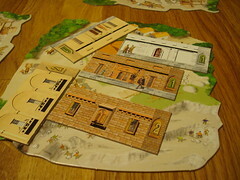 This doesn’t come as a surprise to anyone familiar with other games by author Reiner Knizia, that amazingly productive game maker – he’s credited for more than 300 games, it might well be more – who is often criticised by people that dislike his games for requiring too much calculation in his games. It’s true that you need to do some maths to keep track of your score, how buying the tiles you want will affect and and how many turns you need to properly profit from it. But there is no big numbers involved, and all that is needed is basic addition, so this is not a very high bar. Still, if numbers are your sworn enemies, you might want to avoid Palazzo. If juggling some small numbers in your head doesn’t scare you, then Palazzo shows you quite a good time. You’re never out of the action for more than a few seconds, and the decision what to do and how much to pay for it rarely has an obvious answer. Do you buy from the floor store and pay a bit more, or do you try to get tiles cheaply from the quarry – at the risk of being outbid? Do you take money, or do you hope for someone else to do it instead? Do you try to remodel your palazzo to be all marble, at the risk of being caught with a single floor that ruind your score when the last part of the picture shows up? Especially that last question is always tricky. Being caught by the end of the game before you could insert that single floor into it’s palazzo is usually enough to cost you the game. On the other hand, the gain from successfully remodelling on your last turn is often enough to win the game, too. There is one more thing you need to remember about Palazzo. Don’t think about the theme. If you’re one of those players that keep considering how well the rules of the game capture reality, you’re going to have a field day with Palazzo. The money does not behave anything like real money: all currencies are worth the same, no one in one of the wealthiest and best-connected cities of the time can exchange money, and three small coins from different countries are worth more than the highest bill in any currency. You buy whole floors from the quarry and have no influence on how many windows it will end up having. The aesthetic value – and the victory point value – of your mansion is determined by the number of glass panes it has. Not to mention the elephant in the room: you can easily and cheaply remove and add floors in the middle of a building. But if you can look past those detail and treat Palazzo as an abstract auction game with a slightly mathy scoring system, it’s fun and really doesn’t deserve to be exiled to the shelf for a year before even touching it.